In this post we are going to discuss about Visual Studio Code - A Visual studio for Linux, Mac OSX and Windows. Yes you heard it right, Visual Studio Code free and available on your favorite platform whether it is Linux or Mac OSX or Windows. According to Visual Studio, "Code editing redefined and optimized for building and debugging modern web and cloud applications". 1. Platform Independent : It can run on any platform whether it is Linux or Mac OSX or Windows. You can run on any OS of your choice, unlike the original Visual Studio where it will run only on Windows. We feel that this is by far the most important feature in Visual Studio Code. 2. Language Coverage : A large number of language coverage in Visual Studio Code. Syntax colorization, highlighting, and bracket matching make Visual Studio Code a great editor for a large number of programming languages. 3. Git Version Control : Visual Studio Code has integrated Git support with most important commands like push, pull, merge etc. 4. 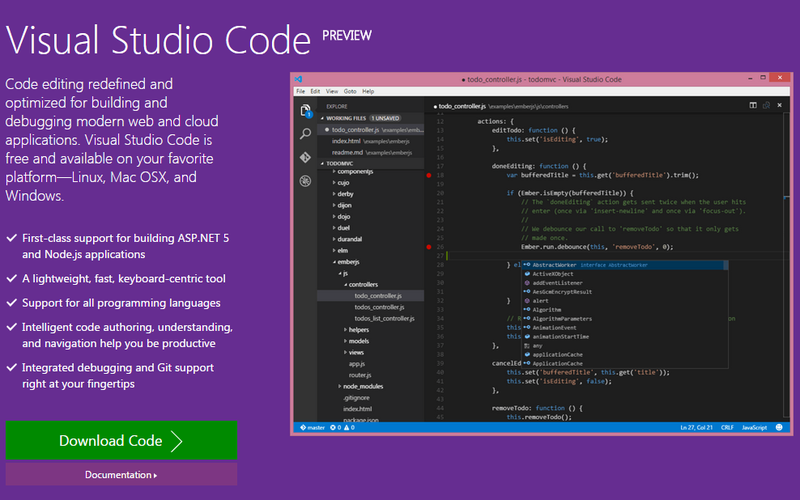 Support of Asp.Net 5 and Node.js : Visual Studio code supports the development workflow of ASP.NET 5 and Node.js.